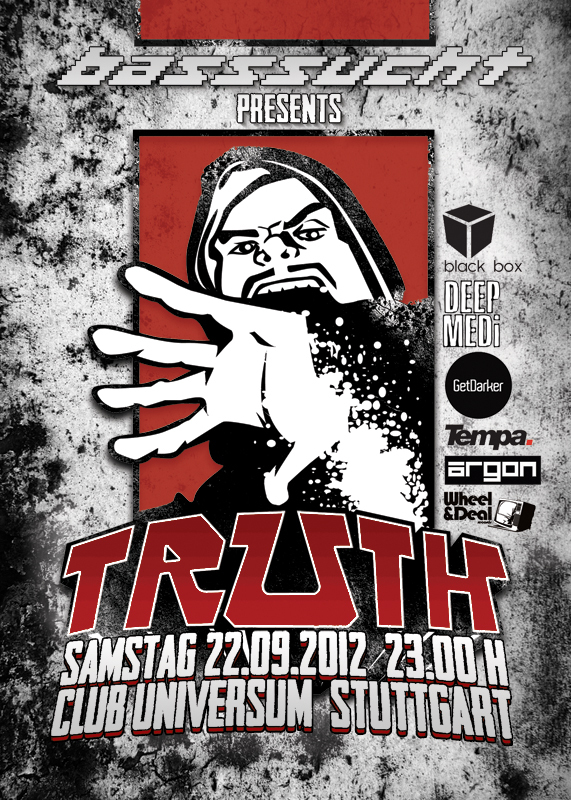 Wir bringen Truth (NZ) nach Stuttgart! Sonic architects of songs with an emotional heft as heavy as the subwoofer rupturing basslines that underpin their work, Truth are one of New Zealand’s finest creative exports. Respected across the globe, since inception several years ago, Truth have, as both world-class producers and party-rocking DJs, cut a clear pathway through the international dubstep scene. On the nightclub and festival circuits, the fruits of their labor have included, four European tours, three American tours, countless Australian and Asian spot dates and a loyal following across New Zealand. Truth has built this performance presence through DJ support from Mala, Skream, Joe Nice, Youngsta, Hatcha and N-Type, giving their music an advance presence at key clubnights like DMZ in London, Club Love in New York and through seminal radio stations such as BBC Radio One, Kiss Fm and Rinse FM. Through keynote DJ support, they have been rewarded with single releases via Deep Medi Muzik, Aquatic Lab, Disfigured Dubz, Wheel & Deal, Argon and Boka Records. Through these, including critically ‚The Fatman‘ (as released via Deep Medi Muzik) and their acclaimed Aquatic Lab released album Puppets, Truth have seen their stock rise, placing them as in-demand remixers and collaborators to The Nextmen, Miss Dynamite, Shapeshifter, The Black Seeds, Optimus Gryme, Silkie, Kromestar, Tunndige and countless figures of note within the international dubstep community.